Dererk Pardon calls for the ball. The senior center has struggled converting his chances in the paint this season. 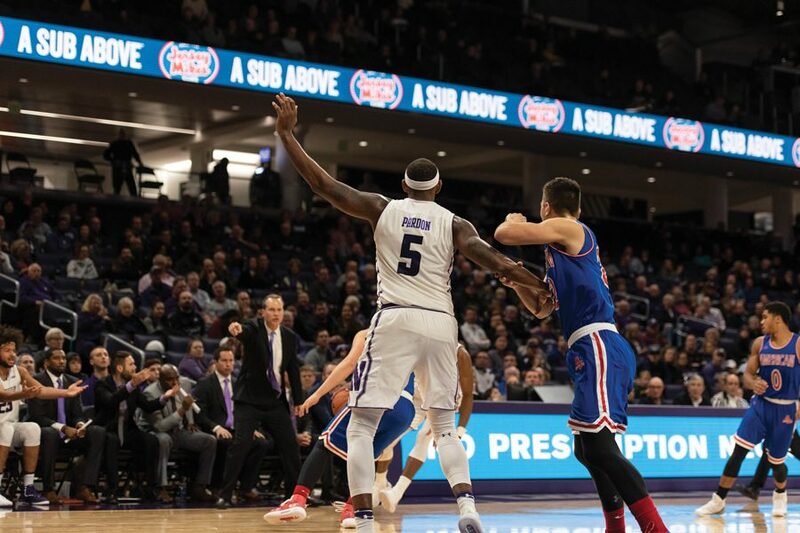 After Dererk Pardon missed ten ugly, contested shots against American, coach Chris Collins argued that the senior center helped win the game for the Wildcats with his offense. Pardon struggled to get scoring chances throughout the season-opening win against New Orleans, and previously Collins stressed that Pardon was an “elite” big man who would be more of a focal point against the Eagles. Pardon finished the 63-51 win over American on Monday with just 13 points — none of them assisted — and all of his chances were created by offensive rebounds or came from isolations in the post. Pardon shot 62 percent from the field last year on mostly a diet of dunks, layups and post moves, and at first glance he’s struggled so far adjusting to his expanded offensive role. “I just can’t shoot 2 percent from the field,” Pardon said. His shooting percentage wasn’t actually that poor, but Pardon now has had two underwhelming offensive performances, scoring 26 points on 19 shots. Instead of looking to Pardon in the paint early against the undersized Eagles in the opening minutes, the Cats took 11 midrange or three-point shots of their first 12. Pardon only took one shot before the under-12 timeout, a wide-open three pointer from the right wing that clanged off the back of the rim. With three minutes left in the first half and at a point where the offense was struggling from the field, Collins called three consecutive post-ups for Pardon and let him go to work from around seven feet from the basket. After not getting a shot in the paint for the first 17 minutes, Pardon missed or passed up all three chances, and the Wildcats finished the half shooting just 40 percent from the field. Even though he finally was getting the ball late in the first half, Pardon wasn’t getting any help from his teammates in making the shots he was taking any easier. His only basket in the first half was a putback layup, and eight of his 13 points came off put-back attempts. To put Pardon in a better position to receive post-ups in the second half, Collins played freshman point guard Ryan Greer fifteen minutes in the second half. Last year, Bryant McIntosh developed impressive chemistry with Pardon and consistently found him for dunks and layups off the drive, and Greer was in to thread that needle. Even though Pardon shot 36 percent from the field, Collins approved of his shot selection. While Pardon only made two of his six post-ups in the second half, he slammed two put-back dunks, including one to virtually end the game by extending NU’s lead to 11 with four minutes left. Even though he was struggling from the field, Pardon finished the game with a team high eight offensive rebounds and four assists. And according to Collins, he had as productive an offensive game as possible for a big man who shot so poorly from the field.